Sic Bo or ‘dice pair’ is an ancient Chinese dice game played on a table with as many as 50 possible wagers and three dice. The objective of the game is to bet on the outcome of the three dice after they are shaken. This could be a specific number or three-number combination. For the most part, Sic Bo is a fast paced game without any frills and ought to appeal to roulette and craps players as well. It’s a simple game with no particular strategy to maximize your winning potential. All you do is place a bet and wait for the roll of the dice and pick up your winnings, if any. Sic Bo tables have specific betting areas where you can place a bet. 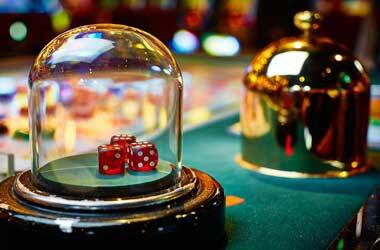 Once you place a bet the dice is rolled and the respective table area will light up if you have a winning bet. Bets are paid out based on the pay-table. We suggest you practice online sic bo for free if you are new to the game so that you get the feel of it before wagering real money. Sic Bo presents an overwhelming number of betting options, which can be classified into six different bet types with each having multiple odds and betting possibilities. The payouts vary depending on the online casino’s policies so make sure to keep a tab on the payout before you play. Big/Small: This is the type of bet recommended for newbies, which pays 1 to 1. You need to place a bet on the total of the three dice being Big (between 11 and 17) and Small (4 to 10). If a triple is rolled then the bet is lost. Double: In a ‘Double’ you bet that the two dice will have the same value. You win if two of the three dice are the right double. Payouts are usually 8 to 1. Two Dice Combinations: You bet on the outcome of the next roll with two specific dice. For example, 1 & 2 and 1 & 5, etc. You win if the two selected numbers are rolled. This bet allows for as many as 15 possible combinations and pays 5 to 1. Odd / Even: Just like big/small bets the payout is 1 to 1 but is not available at all tables. In this you bet on the total of three dice being either odd or even numbers. You lose if a triple is rolled. Totals: You can bet of the total of the three dice, which allows you to make up to 14 different bets. The payouts could be as low as 6 to 1 up to 50 to 1. For example, a Total of 9 can pay 6 to 1 while a Total of 4 or 17 can pay as high as 50 to 1. Any Number: Sic Bo also offers the option to bet on any number 1 through 6. If one or more dice rolled is the correct number, you win. Payouts are 1 to 1 for a single dice match, 2 to 1 for 2 dice matches and 3 to 1 for three dice match. Our experts suggest that to begin with, it is important to remember that the house advantage ranges from 2.78% to as much as 30%. Make sure to choose betting options with the lowest house edge and compromise on lower payouts rather than accumulating losses. Big/Small bets and Odd/Even bets have a house edge of 2.78% so focus on those as a beginner. Alternatively, if you are inclined to play a few games then go for bets with higher payouts such as a triple bet. The house edge on triple bets in online Sic Bo is around 16.20%. No roll of the dice is related to previous games so don’t waste time on game histories. There are plenty of US friendly online casinos that offer Sic Bo and its various betting options. You will find a comprehensive list right here at CasinoUSA.com. Ideally, we want you to play at the best casinos so that you get better experience.